Teachers are improvisational artists and expert weavers. They possess complex schemas informed by their own educational, personal, and professional experiences. They weave together these diverse strands into the complex tapestry that is their instruction. ACTIV8 MATHTM professional development is designed to support teachers in this process. In these interactive and differentiated ACTIV8 MATHTM workshops teachers draw from their own expertise to improve student outcomes. 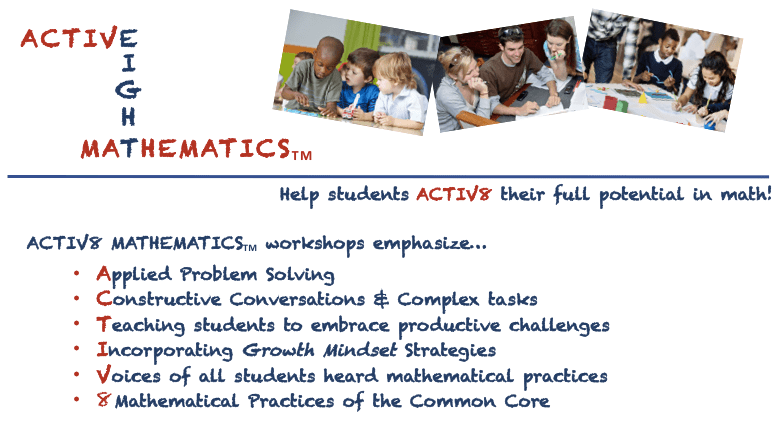 ACTIV8 MATH workshops use interactive activities, real-life examples, current research, and teachers’ expertise to facilitate professional growth. Educators, coaches, and administrators walk away with strategies they can implement the very next day. Differentiated workshops cover fostering a Growth Mindset, supporting English Learners, and facilitating group problem solving. Rates: Workshop or Coaching: $1500/day or $800/half-day plus mileage and materials (≤ 40 students). Consulting: $150 per hour. I was at your growth mindset workshop a few weeks ago and at Jo Boaler’s presentation in Salinas last week. I am writing because I had a very strong inclination to share the excitement I am feeling right now!! I understand numbers! Somewhere in the beginning of last week a new energy surged through me to teach math… I am so excited for it! I have been teaching for 6 years, and I have always been scared of teaching math, probably because, as a kid, I was always “good” at math but never really understood it. Now, suddenly, thanks to you and Jo Boaler, I am understanding. More importantly I am seeing the horrible stagnant mindset mistakes I have made in my classroom. Actually, not horrible! They are a learning opportunity! My students CAN learn! Felicia, I am just extremely, super, over-excited about this and I cannot wait till Tuesday so I can begin teaching with only a growth mindset. I wish it was the beginning of the school year instead of the beginning of the last trimester. Again a very big thank you to you and to Jo. I will try to make it to as many workshops with you and her as possible.